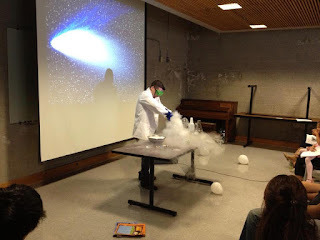 The Planetary Society's Nick Freher makes a comet from scratch! 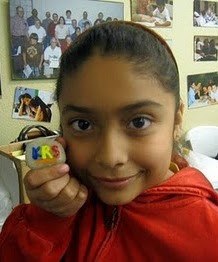 After April’s dance theme, May’s KRS program took a trip a little further from home. Focusing on astronomy and outer space, KRS partnered with the Planetary Society, an organization that advocates for greater federal funding for space programs. For the first hour of the program, KRS students at the Union Rescue Mission, STARS, and Villa Parke locations worked with volunteers to continue improving their reading skills. The Planetary Society’s Giovanni Somoza led the second hour’s presentation at the URM, beginning with an introduction to the vocabulary every budding scientist needs to take to the stars! After learning how to spot the difference between comets, quasars, and nebulae, the KRS students at the URM had the opportunity to put theory into action. 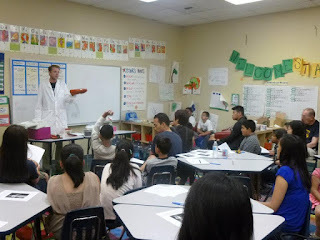 Mixing dry ice, sand, and ammonia, Giovanni demonstrated how a comet forms in space and brought other experiment sheets for the students to try at home. Clark Wiant and Nick Freher led the science portion of the programs at STARS and Villa Parke, respectively. At the end of the day, students got to take home a number of prizes, including mini-planets, stickers, and a little more knowledge about outer space. Special thanks to the Planetary Society and their wonderful speakers for helping put together this month’s program!